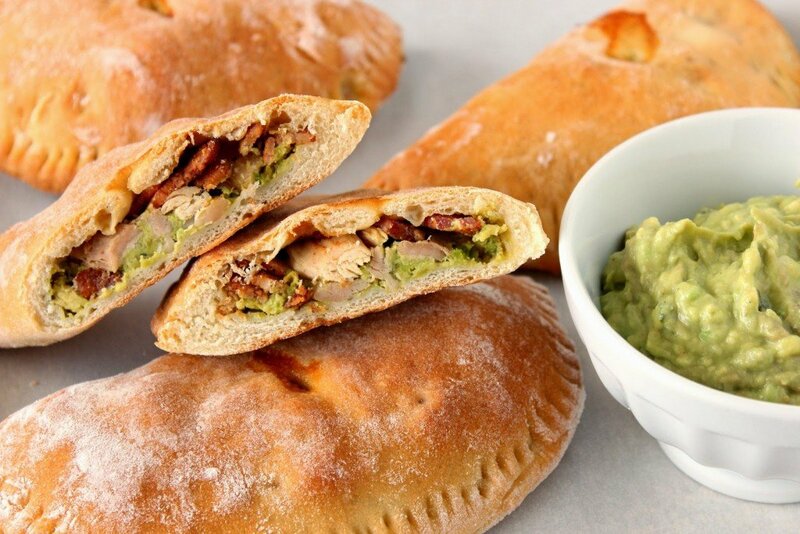 All you need is one hand to hold and eat one of these delicious Chicken, Bacon & Avocado Calzones. However, you’ll need both hands to give the round of applause you’ll be happy to give after you had your first bite. 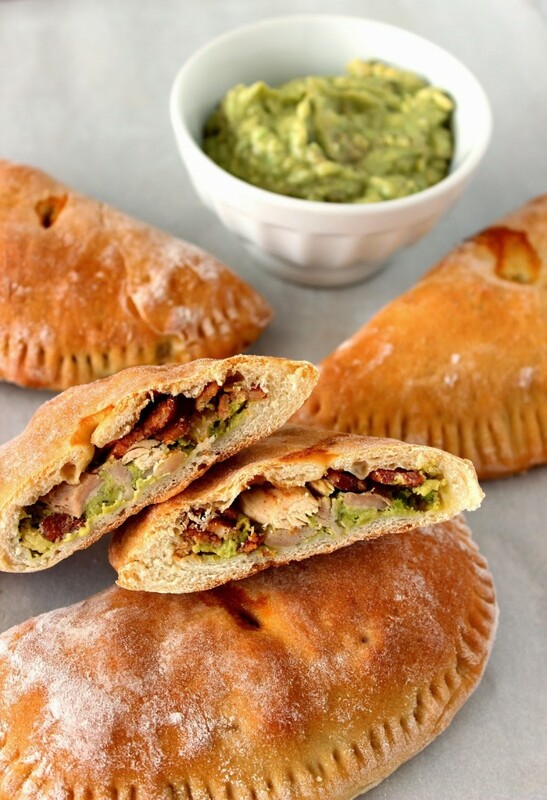 I’m super excited to be sharing my original recipe for Chicken, Bacon & Avocado Calzones with you today! 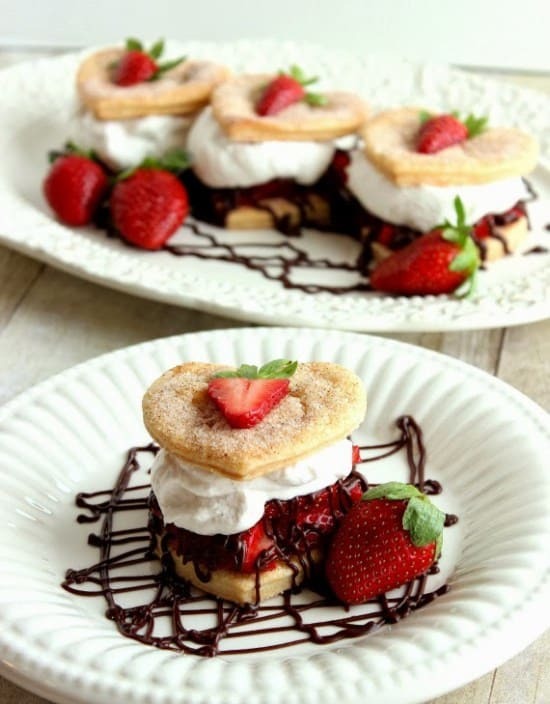 I came up with the idea for this recipe when I won the February 1,2,3 Cook and Snap Recipe/Photo contest (hosted by The Foodie Blogroll on facebook) with my Deconstructed Strawberry Pie with Cinnamon Whipped Cream and Chocolate Ganache recipe (pictured below). One of the perks of being the winner of last month’s contest was that I was presented with the opportunity to choose the 3 key ingredients for this month’s contest. After much deliberation, I decided to choose Chicken, Bacon & Avocado Calzones because I just knew there would be some really spectacular recipe competition out there for me with these incredibly flavorful ingredients. 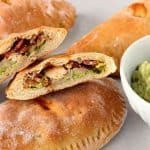 I think what you’ll really love about this recipe for Chicken, Bacon & Avocado Calzones is the ease in which you can whip these up for a busy weeknight dinner. With easy-to-use ingredients like store-bought rotisserie chicken, prepared pizza dough (I made my own, but feel free to use ready-made) and even store-bought pre-cooked bacon and guacamole, in a matter of mere minutes these yummy calzones can be on your dinner table. Dissolve the yeast in the warm water. Add the sugar and allow to sit and get foamy (about 5 minutes). Add the olive oil to the yeast mixture. In a stand mixer with the dough hook, mix the flour and salt. Pour the yeast mixture into the flour mixture and mix with the dough hook until all the flour has been incorporated and the dough comes together to form a ball. *Note - If the dough seems too wet and sticky, add in a bit more flour until the dough is only slightly sticky and yet smooth and elastic. Cover the bowl with plastic wrap and allow the dough to rise in a warm, draft-free place until double in size (approximately 1 hour). In a medium bowl, mash the avocado mayonnaise ingredients together and keep refrigerated until ready to use. Divide the pizza dough into 8 equal pieces. Work each piece of dough into approximately 6" circles. *Note-I used my fingertips and hands to do this. I didn't use a rolling pin but you might want to if that works better for you. Spread about 1 to 1 1/4 tablespoons of the avocado mayonnaise on the bottom half of the pizza dough circle, making sure to keep it from the edge. *Note-You'll have leftover avocado mayonnaise so make sure you use it for dipping sauce when you serve the calzones. Top the avocado mayo with a bit of the shredded chicken (approximately 1 tablespoon) and top the chicken with some of the cooked bacon. Wet the bottom edge of the pizza dough with a slight bit of water and then carefully stretch the top half of the dough circle over the filling and press it firmly to the bottom half of the dough circle. You now have a half moon shape. Press the tines of a fork firmly around the edge of the filled calzone and use a paring knife to cut a small vent hole on the top of each calzone. Continue the same process with the remaining dough. Place each calzone on a parchment lined baking sheet (4 per sheet). Cool slightly and serve warm with the remaining avocado mayonnaise if desired. 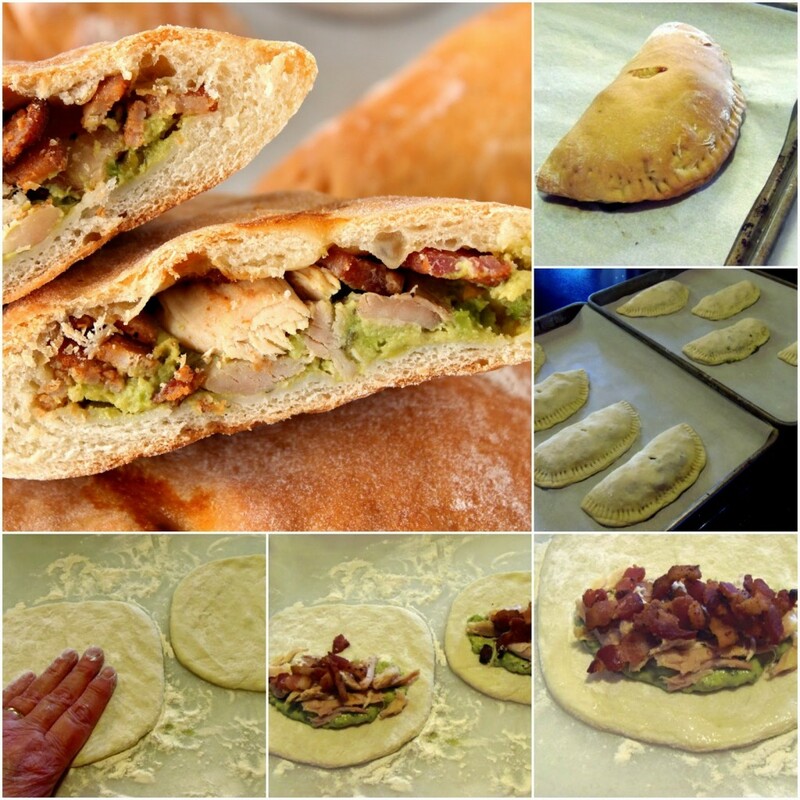 I hope you’ve enjoyed this recipe for Chicken, Bacon & Avocado Calzones as much as I’ve enjoyed bringing it to you. 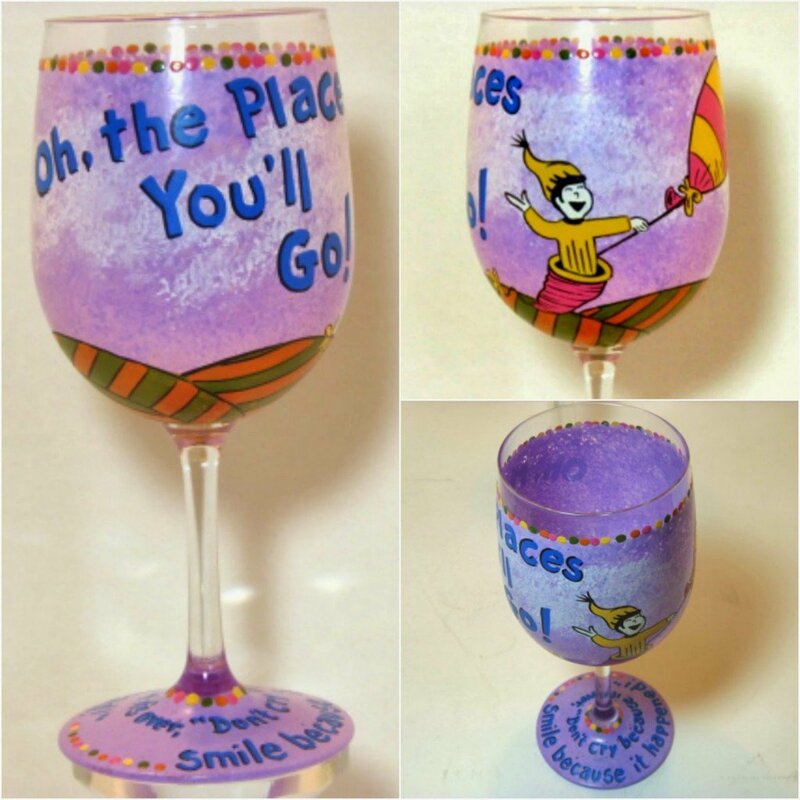 And now, because March is the official month of Dr. Seuss, I’ve chosen to coordinate this recipe with this custom glass I painted for a client last year, at her request. “Don’t cry because it’s over…Smile because it happened!” 🙂 Good advice, don’t you think? Yum! They look amazing Renee 🙂 Good luck!